The Esposito family of Abbotsford knows a thing or two about the entrepreneurial spirit. About starting something from scratch, and seeing it succeed. About facing adversity, and starting all over again. And about helping people to reach their potential and pursue their dreams. That’s why, when Paul Sr. and his sons Paul Jr. and Frank were discussing the focus of the gift they wished to bestow upon the University of the Fraser Valley, the idea of supporting innovation and entrepreneurship resonated with them. 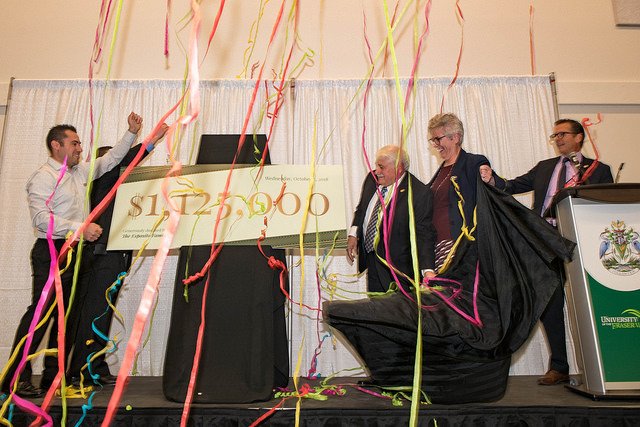 The Espositos recently donated $1.125 million to UFV to support activities related to innovation and entrepreneurship. Most of the funding ($1 million) will go to support a centre for innovation and entrepreneurship to be named after the Esposito family. $125,000 will be endowed to support annual student awards. Being entrepreneurial is a way of life for the Esposito family. Paul Sr.’s parents brought what grew to be a family of 12 kids over from Italy after World War II because they were weary of war and fascism and wanted a fresh start in a new country. His father worked at whatever jobs he could find to support his family, from owning his own bakery in Italy to working as a janitor in Canada, while his mother kept the house and all the kids in order. Paul Sr. started working in a grocery store at age 13 in Trail, BC, and earned enough money to attend the University of Victoria. After finishing university, he became a high school educator and enjoyed finding ways to bring out the best in each of his students. Having an entrepreneurial spirit, he decided to renovate and build houses. This eventually led to him leaving his teaching job and the starting a successful career in the construction industry, which continues today. Paul Sr. expanded his professional horizons and entered the hospitality industry when he opened the original King’s Crossing and Finnegan’s Pub in 1987, because his entrepreneurial eye spotted an opportunity to better our community and expand entertainment options in Abbotsford. 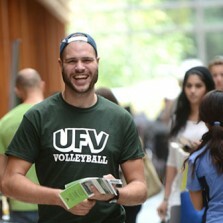 The Espositos have a long history of connection to UFV. Finnegan’s Pub was located right next to the Abbotsford campus, which opened a few years before Finnegan’s in 1983. The original Finnegan’s was a social hangout and popular lunch and dinner spot for several generations of students and employees, as well as the general public. Over the years it expanded to include a conference centre and small hotel, which the university made use of for hosting events. Some jokingly referred to Finnegan’s as Building F, playing off UFV’s habit of naming its buildings after letters of the alphabet. The lunch spot was so popular that plowing a path to Finnegan’s was an important part of clearing activities when a snowstorm hit. Unfortunately, the original pub and conference centre burned down in 2005. The Espositos rebuilt and opened the new Finnegan’s and Phoenix in 2009, and the university population was once again a key part of their customer base. The Espositos ran Finnegan’s Pub and Phoenix Ballroom facilities until this past January, when they made the tough decision to exit the full-service food and beverage business. “It is an important life lesson that when your passion for something begins to fade it is best to move into a new direction,” said Paul Jr.
“Having originally entered the hospitality industries to better our community, it brings great comfort that UFV bought the property and it will continue to be used to positively contribute to our community,” he added. With their donation, the Esposito family is excited about helping to spark the entrepreneurial spirit in UFV students for generations to come. The Espositos employed many UFV students over the decades in their businesses. “It was personally very satisfying to see the students we employed succeed and positively contribute to our society,” they noted. Paul Sr. and his sons are excited about the legacy they are creating.